I’m up in the middle of the night, again! I went to bed early (10:15 or so) and fell right asleep. When I woke up, it was still dark out, but I thought it must be almost time for the alarm to go off (alarm is set for 5:30 am) cause I was wide awake and felt rested. But, I looked over at the clock and it clearly showed the time to be 1:30 am! My reaction was that it couldn’t possibly be correct – I must have got it off kilter somehow! So, I pressed the button on the side of my watch to illuminate the face and it confirmed the clock time! It was, indeed, 1:30 am! Still skeptical, I wondered what the odds were that BOTH the alarm clock AND my watch were incorrect. Then, I noticed that all three girls were sound asleep – no stirrings or excitement that I was obviously awake! They, of course, are the definitive clock in our house – they wake at precisely 6:00 am, they insist on breakfast no later than 7:00 am, they start to get all worked up over supper at exactly 4:30 pm, and they start pacing around ready for bed by 11:00 pm! So, since they were not at all curious about why I was up, I finally conceded that it must NOT be time to get up! I tried to resist getting out of bed, but (as the borg taught us) resistance was futile! I tossed and turned and got myself all tangled up in the covers. I finally just gave up and got out of bed! I went to The Shops at Steele Street for the open house on Saturday to see what Amy had to offer. I had a nice chat with both Jonathan and Amy and bought some sweet treats and a couple dip mixes. Wise Amy (or maybe it was his idea – either way, it was wise) put Jonathan at a table right inside the door as the gracious greeter with samples….he’s such a sweetheart (with or without the samples)! I’m glad I popped in – it is always a pleasure chatting with the Burns’ and I have my first Christmas gift taken care of! I’ve been really pleased that I started doing Netflix! I have 50-some movies on my wish list – I get 3 in the mail and turn those babies around quickly to get the next bunch and make the most out of the membership price! A couple weeks ago I wrote a post about wondering which would be a better way to go — well, I have since found out that DVR from Charter isn’t an option at all… I called to see what it would cost and how it works and they told me it isn’t available in this area, yet! What? I don’t have a lot of complaints about Charter Communications – I rarely have outage problems or other issues that I hear others in the area have. But one complaint I do have is that they are WAY behind the times! Time Warner has sooooo much more to offer and the price (from what I hear friends in the Raleigh area pay for comparable service) isn’t all that much different! I don’t like the dish option at all, so I will stick with cable, but I just wish Charter would get with the program and give us the options that we could get if we were allowed the flexibility of choosing our cable company! I snoozed through Monday’s DWTS, so I didn’t post an opinion for who might get voted off, but if you are a friend on my Facebook, you may have read my comment that I thought Maurice and Cody would be in the bottom 2 and that Cody would be my choice for who will go home! Well, I was right about the bottom 2, but it was Maurice that went home! Jamie was right — the teenage girls with text messaging capabilities had more power than Maurice’s fans! But – he’ll likely go next week. My thoughts on the bottom two next week are Cody and Lance – in which case, Cody is sure to be the one to go! My prediction for the finals: Brooke, Warren, and Lance will go head to head for the final show and Brooke will, of course, win it! Well, maybe I can get a couple hour’s sleep before the alarm is REALLY ready to go off…although, I’m not a bit tired, so I have my doubts! 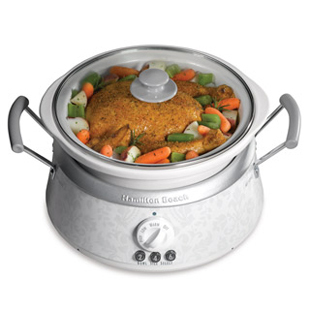 That is a really cool crock pot! I have never seen one like that. I hope you sleep well tonight!